I'm featured on pages 67 and 68... and even a little on 69! Seeing my words and designs in print is a bit surreal each time. The thrill is hard to describe. I think I floated all the way back into the house to show my family, because I don't really remember walking. Christine did a wonderful job of weaving all four of our inspirations/motivations for a handmade life into one seamless piece. It was my first time being interviewed via phone, rather than just writing down my answers to questions. I won't pretend I wasn't nervous at first, but it felt much more like a warm and friendly conversation than anything else. Thanks so much, Christine! 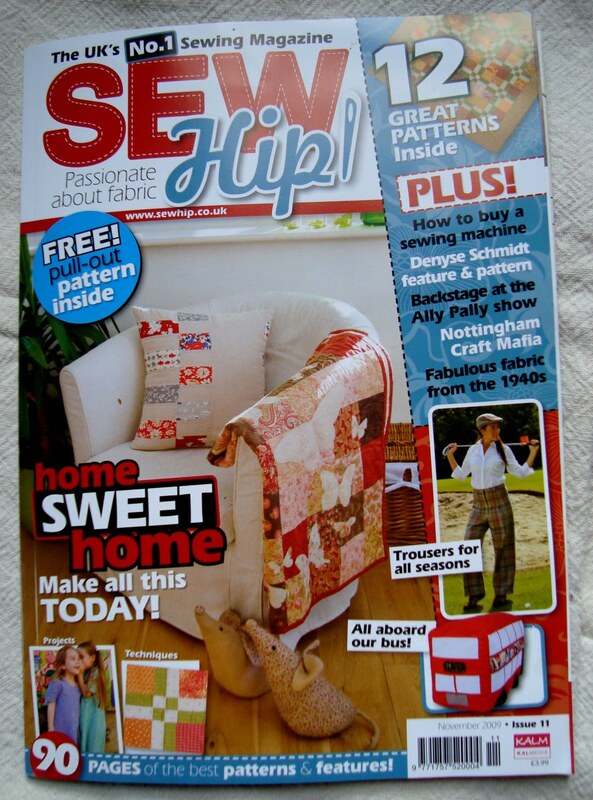 Sew Hip is a UK based sewing magazine that is available in the states at fabric shops. I've even gotten a hold of copies at Barnes and Noble. I'm not sure when this issue will be available, but I'll be on the look out. Editor's Note: Because it is harder to locate the magazine in the states, Christine has now put the article up on her blog in its entirety for you to enjoy. Go here. So, moving right along to the next handmade project... can you guess what these are being prepped for? Yes, it's time for the next rendition of the TP roll count down calendar! I'm quite excited about this year's version. Hoping to unveil it soon. It's totally different from last year's. Ok, I'm starting to save now! I may have to ask some friends to save theirs since it's so close! Can't wait to see! Oh, yes please start saving. I'm late in the game so I didn't want to pressure anyone to save... I'll have some alternatives to rolls, as well. However, if you ask around EVERYONE does have some! 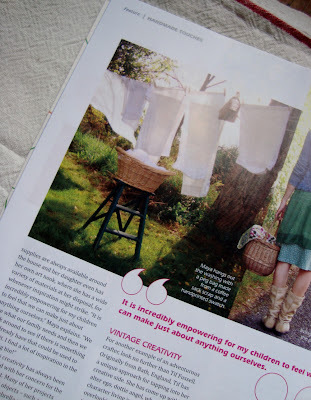 wooohoo for the feature in Sew Hip ! Congratulations, my friend !! I had swaped an issue last year, and it's a great mag ! Ah, I was not totally wrong with my idea of advent calendar ... eheh, can't wait to see what it will be, and how it will look like ! Congrats for the interview, do let us know if you see it out here. Can't wait to see what you've got up your sleeve. 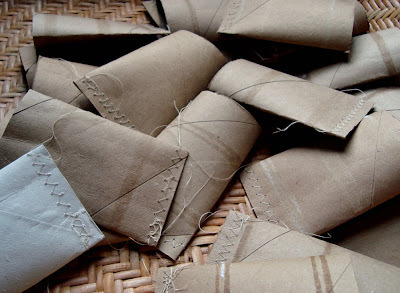 I'm already saving cardboard rolls for a different project, looking forward to seeing yours. I love the image of you floating to the house from the mail box. You have to be on cloud nine and I am so so so happy for you. What a dream a wonderful wonderful well deserved dream come true. Keep up the good work! You share such wonderfulness with all of us. Maya, this is Fabulous!! You are seriously on a roll with all the magic over here. And thank you for including a link to our e-course in your "Enjoy!" ~ yup, you're the best. You really are becoming a global sensation. I am so happy for you. It's an honor to be featured with you, Maya! I was so surprised to open the magazine and discover such well-known names (and designs!) alongside mine. Take care! Congratulations Maya! I think you were a perfect fit for the theme and inspiration for the article! I got the magazine a couple of weeks ago, and the article is great. Flicking through I thought - I recognize those scissors, lol. congrats, maya! i'll have to search for a copy! Thanks for all of your loving comments, friends! Can't wait to see what's happening with the TP roll project! Looking forward to the advent calender! I must go and wrestle my copy from my friend up the road! We share a subscription to this magazine and recently it has been getting much better - but if you're in - it must be FAB! Congratulations, I hope that you get lots of readers in the US! First of all, congratulations - I stumbled onto your blog in my futile search for this magazine in America:) And the toliet paper tube advent - I have to try it - I love it! In Portugal there was the tradition of Advent calandário now with globalization begin to appear in stores. This idea is environmentally friendly and genial. Thanks for sharing I am anxious to see how it goes. Wow, loving the two photos you posted. You got potential. Please come visit my site Charlotte Business Services And Classifieds when you got time. Just found your blog and I believe we must have been separated at birth - my graphic design company is called Luna and my daughter's name is Maya. Love your projects! Maya and I created your toilet paper roll advent calendar on a string over Thanksgiving weekend it turned out SO CUTE!! Thanks for the ideas!! Congrats on being included in such a wonderful article with such talented women. You are truly one of those who inspire me. More articles should be written about you. 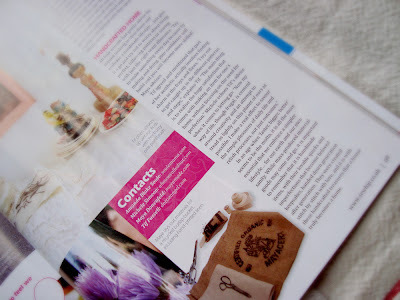 This is my FAVORITE sewing magazine! I can't wait to see your article! My local Joann's carries Sew Hip....but I am thinking about just getting a subscription so I don't ever miss an issue.